If you’re running a custom recovery, it’s very likely that aside from flashing ROMs, you also use it to create and restore backups. In case you’re not aware of this marvellous function, a Nandroid backup is essentially a complete snapshot of your phones operating system—application data, and all—that be restored via recovery. It’s always a good idea to keep a backup of a nice stable setup just in case of emergency, but it can be a pain to restore it just to do something simple like grab a few specific files. Thankfully XDA Senior Member Goddchen has come up with a solution for that problem. 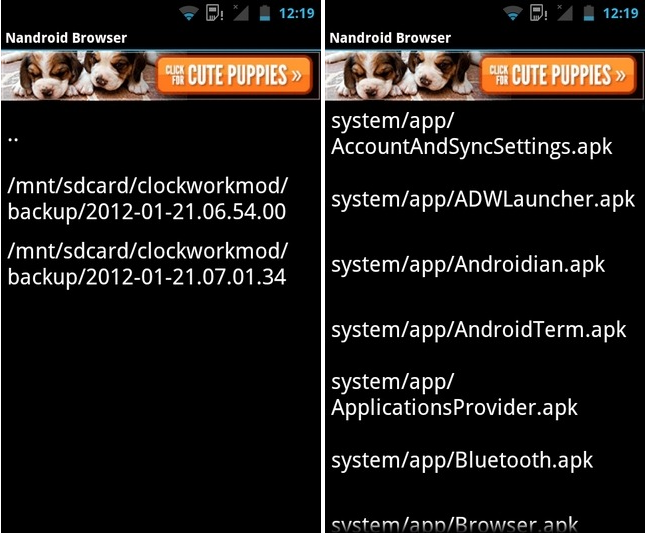 Nandroid Browser does exactly what the name implies. It’s an application that allows you to browse the contents of your backups and utilise the single files within. Once you’ve found the required file or app, you can then save it to another location, open it directly, or share the recovered item. The application currently supports backups in the yaffs2 (.img) and ext4 (.ext4.tar) formats, and should therefore be compatible with the majority of custom recoveries. While this is a very useful application, it does bring to light a quite serious and perhaps scary point which was picked up on by our ever vigilant Portal Admin, Will Verduzco (Ed: I try). It highlights the fact that these backups are not in anyway encrypted, and how easily an application with SD Card and internet access permissions can browse and manipulate these files—potentially stealing your data in the process. However that’s no reflection on this app, which could prove to be a very useful tool for many people. If you want to test this out for yourself then you can download it from the original release thread.